From time to time, Bardfilm and Shakespeare Geek have tried putting a Shakespearean spin on some of the classic genres of humor. In the past, they’ve tackled light bulb jokes and dealt with why the chicken crossed the road. Finally, the great challenge of the Knock knock joke proved irresistible. Here are some Shakespearean knock knock jokes that you can use to entertain or torment your friends, colleagues, and children. No, you don’t need advanced Shakespeare knowledge to get all of them – but it certainly helps sometimes! Oberon the other bank you might try to catch some fish. Dog bury a bone in my petunias again, dog get sent to the pound. Julius, seize her! She’s the one who stole my wallet! The Earl of Oxford who? Nay, answer me! Stand and unfold yourself. Layer Ts and sweaters to stay dry and comfortable on the ski slopes. Ha! Fooled you! It’s really the Lark. Or Lando or Leia or Luke or Chewbacca will pilot the Millennium Falcon. Knock, Knock, Knock, Knock, Knock, Knock. Tom R. O. and Tom R. O. and Tom R. O. We creep in this petty pace from day to day. Shelly compare thee to a summer’s day? Hal long until Henry IV dies and I can become king? Utah me language, and my profit on it is I know how to curse! The cause, my soul who? Let me not name it to you! Rosencrantz. No, wait, Guildenstern! *sigh*—let me get back to you. Ferris foul and foul is fair. Lie, Sander, and you’ll get in trouble, Sander. Oh, that’s real nice, Daddy. I come all the way from France with an army to rescue you and that’s the welcome I get. Will Shakespeare or just stand there holding one as long as I get to be on stage. Riese and not the need. The Porter from Macbeth who? The Porter from Macbeth, who wants to know how you like it! Knock, Knock. Knock, Knock. Knock, Knock. Knock, Knock. Knock, Knock. Knock, Knock. Knock, Knock. Knock, Knock. O FOR A MUSE OF FIRE! Just try to Demetri us before we Demetri you! Ham let Ophee fall in love with him. Helena handbasket is where this world seems to be going. Well, I know it’s not Hamlet, but it’s not that unknown. Yeah, that’s what Romeo said as soon as he saw Juliet. 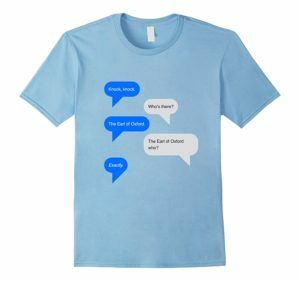 Shakespeare Geek Merchandise Now Available! Lloyd, what fools these moytals be. William Shakespeare cans so they explode when you open them. Interrupting Richard the . . .
Amos shapen knave; his mother was a witch, and one so strong that could control the moon! Otis too, too solid flesh! I wish it would melt, thaw, and resolve itself into a dew! Otis too true! How smart a lash that speech doth give my conscience. Mike Ingdom for a horse. Arthur world’s a stage, and all the men and women merely players. Make up your mind! Who’s there? Toby or not Toby, that is the question. Our thanks for this guest post to kj, the author of Bardfilm. 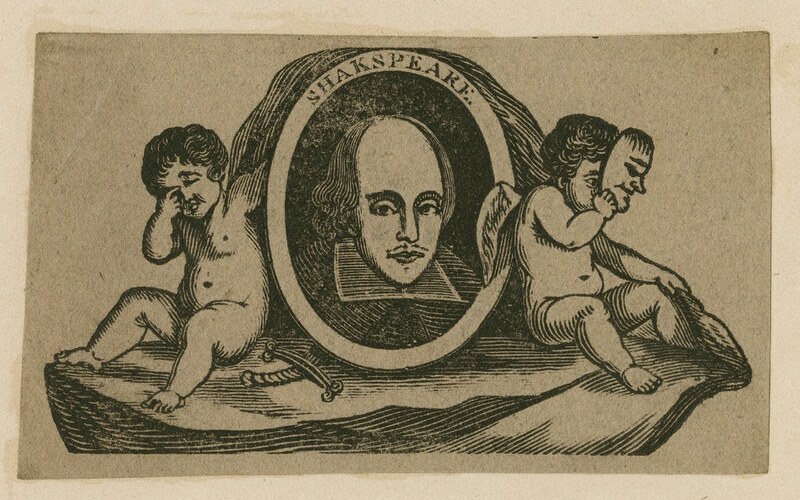 Bardfilm is a blog that comments on films, plays, and other matters related to Shakespeare. If you have a knock-knock joke to share, post it here in the comments! Sorry, no knock knock joke, I just wanted to say I LOVED the interupting Chorus na dthe 'Et tu Brute." They were hilarious. Ro' me over & scratch my tummy, please! Those pieced-together jokes are great! I have one to go with the Oberon joke. Tie Tanya up outside; dogs are not allowed inside this store. No! I was answering your knock-knock joke, Francisco, not quizzing you on your cues. Oh, I just thought of something to say if anyone you really dislike ever starts to tell you a knock-knock joke. Capon, coxcomb, idiot, patch, either get thee from the door or sit down at the hatch! [To someone else] Go you, [person you're talking to]. If it is a suit from [person who's trying to tell you a knock-knock joke], I am sick or not at home; what you will, to dismiss it. And I could probably keep coming up with weird Shakespeare references that have to do with knocking on doors all day, but then you would get bored. So that's all. O Romeo, i love you. One morning I murdered King Duncan in my pajamas. How he got in my pajamas, I’ll never know.